Dr Kiran Bedi recently spoke to the ISB Community on Leadership Effectiveness and Gender at the Indian School of Business (ISB). 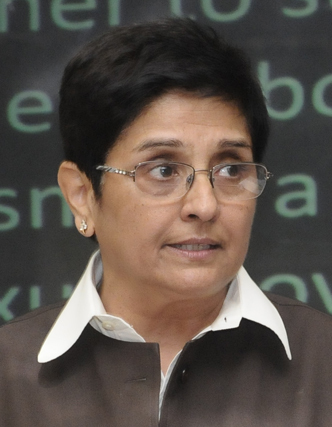 Dr Kiran Bedi has many firsts to her credit – from her foray into the Indian Police Service to her stint at the Tihar Jail, where she conducted meditation programmes for the inmates. No one had attempted this before and her efforts won her a Magsaysay award in 1994. She is famous for being no.1 but she is loved because she allowed a generation of Indian women to dream. She was in ISB to talk about leadership effectiveness and gender. Professor Stacy Blake-Beard, while introducing Dr Bedi mentioned India’s unenviable track record in terms of women’s development. India was rated 114 out of 134, according to the global gender gap report, published by the World Economic Forum that tracks women’s equality with men. While a third of college students were girls, there were very few making it to the top, 54% of companies listed in Bombay Stock Exchange have no women on board. Dr Bedi began her talk against this backdrop. “There is really no difference between men and women in the corporate field,” she said. The mood was set. She told the audience of mostly ISB students and staff about her struggles as she entered the police academy. It had not occurred to anyone in the academy that there could be women officers so they had not planned for it. In addition to logistical issues, there were doubts regarding her physical skills. So, she trained with the men, wore what they did and started a trend by conforming and defying both together. This dogged perseverance in face of adversity that captured the country’s imagination 30 years ago continues to hold another generation of youth spellbound. “Master your work,” she urged the young men and women. She has been a role model for women in this country for many years “This world is full of opportunities and with integrity and continued learning, you can make it.” Her advice was borne out of her own lifelong quest to learn, grow and work hard with community service as the intent. So even post retirement, she has found time to write books, host television shows, work with nonprofits and of course, write blogs about her life. She also spoke about the responsibilities of being highly visible. Her high profile life has always been under scrutiny but her ability to move on and continue to work even harder has given her opponents nothing to report. She peppered her talk with practical advice for the young women with a jibe or two aimed at the men, exhorting them to support their partners in whatever choice they made. By sharing her story with humility and frankness, she established a bond with the audience that enabled them to talk openly about their insecurities. Her firebrand feminism became apparent when she encouraged the women in the audience to look for options so they could continue their careers. Her talk was very well received though she needn’t have said anything. Her life says it all. Social activist, retired Indian Police Service (IPS) officer and Ramon Magsaysay awardee in 1994 for Government Service.